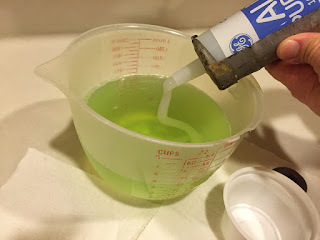 Mix the water and dish soap in the bowl. 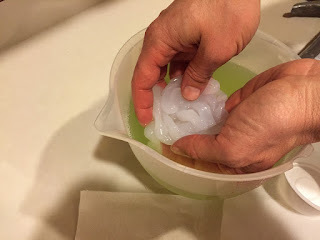 The glycerin in the soap acts as a catalyst that enables the silicone to fully set up. Squirt the silicone into the soapy water (5 ounces should be plenty). 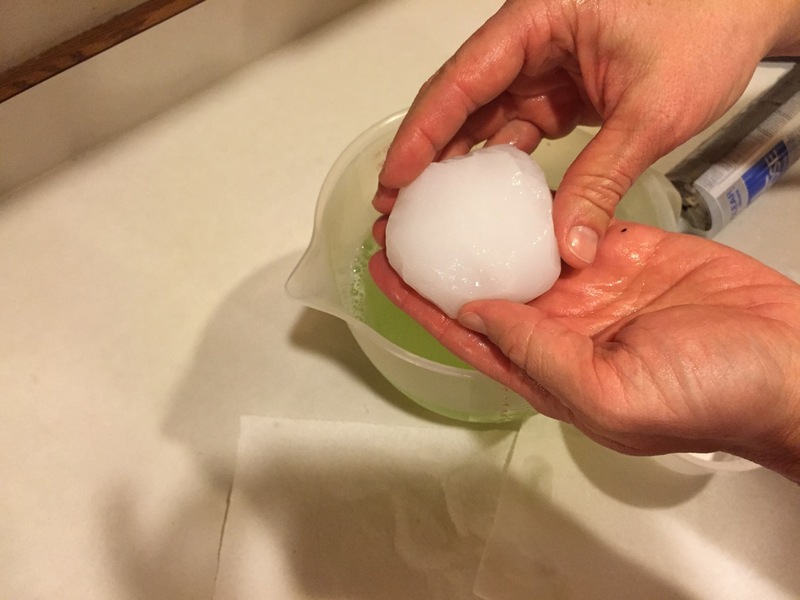 With your fingers in the bowl, mold the “snake” of silicone into a ball. Continue to knead it till you sense it begins to set (this should be about a minute). Lift the ball out of the water and shake off. With the ball in one hand, push the donut into it with the other, ensuring that some silicone goes into the hole to the halfway point. Place the ball of silicone and the donut into the container. Push the donut down to the halfway point. Level the silicone around the edges so that the silicone isn’t higher on one side than the other. Let it cure for several hours (I did mine at night and left it over night). 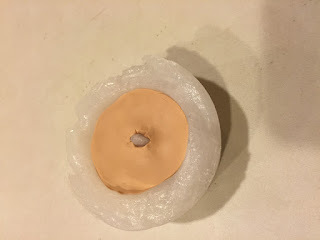 Once fully cured, remove the donut from the silicone and the silicone from the container and wipe the mold with a paper towel. The clay must be kneaded till soft. There are four parts of clay per package of Bake Shop Sculpey. 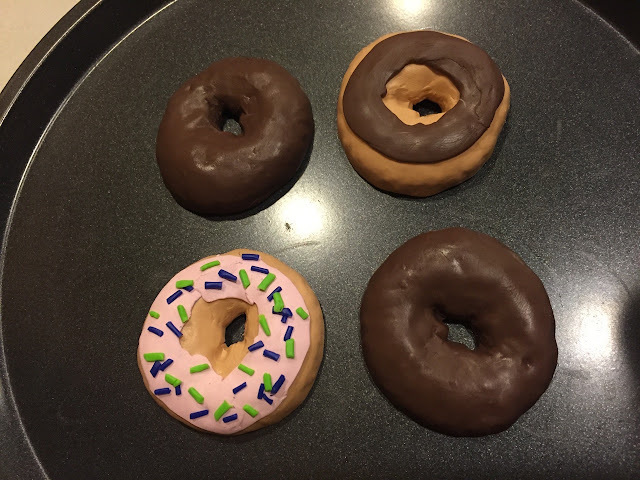 I used about 1.5 parts for each donut. 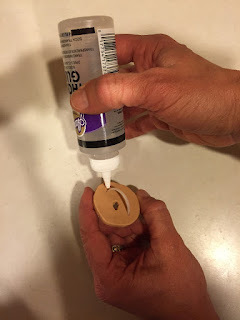 After the clay is soft and pliable, roll it into a chunky snake 4-5 inches long, connect the ends into an “O,” and smooth out the seam. 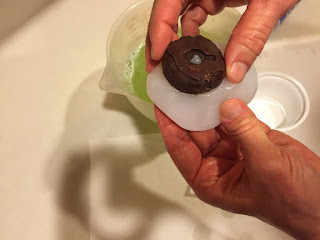 Put the “O” into the mold and push down till the clay spreads out to all parts of the mold. Remove the clay from the mold, flexing the mold if needed. Smooth cracks and bumps. 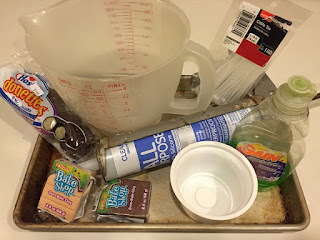 Consider adding other features if desired, such as frosting (white clay) and sprinkles (colored bits of clay or actual sprinkles). To create a loop behind the donut, use a metal ring, such as the inexpensive adjustable ones available at Partyland. At this point, I used a tool to push the clay snug to the ring so there wasn’t much space there. Bake facedown following instructions on the package. 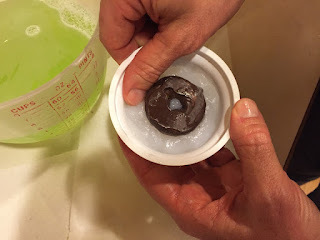 Once cooled, add a touch of glue to where the ring goes into the donut (for stability and strength), then coat the donut with acrylic spray for a glossy look. Think about that—he saw a problem, then came up with a solution that nobody had thought of before. One of the purposes of Cub Scouting is Personal Achievement. This means that you do great things. Sometimes opportunities to do great things happen when you see a problem and come up with your own unique solution. You will have chances to make a difference in your family, with your friends, and at your jobs because you will think of solutions that nobody else will. This is the lesson of the donut.